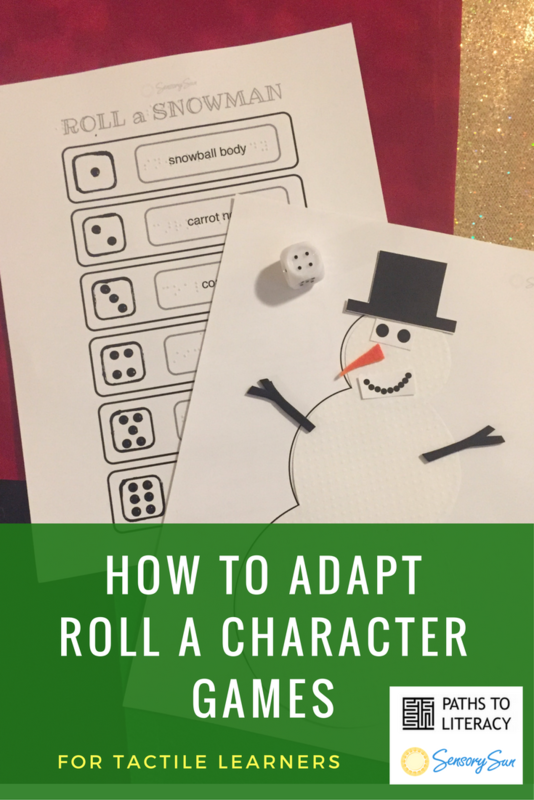 The popular "Roll a Character" printable games can be adapted using braille and tactile elements for players who are blind. It's easy and doesn't take much time to prepare if you plan ahead! First, print the game instructions using an ink printer, or a braille embosser if available. Add braille text to the ink only printed pages. You can either add braille numbers to each of the dice or use puffy paint to fill in the dots for a tactile image. Next, print the template for the character pieces. You can then simply place the template on the desired paper or material and cut out both at the same time, or trace the template outline onto the material to cut out. Consider using different textured papers, felt, foam and other materials that will make the pieces easily distinguishable. Some lightly textured papers can be used in ink printers to simplify the process. You could also print the black and white templates to create raised line drawings of each piece using a braille embosser that prints graphics or a PIAF machine. Finally, add any other tactile elements you wish using glitter glue or other embellishments. Allow to dry/set before using. The game can be played by one or more players. Each player should have his/her own character pieces but the game instruction board could be passed around along with the dice. The player then finds the number on the instruction sheet and reads the character part to add to his/her character. If the player does not already have that part, he/she finds the tactile piece and then adds it to his final character sheet. The die and instruction sheet are passed to the next player who then completes his/her turn in the same manner. Play continues until one or all players complete their characters. The Dice App for iOS is a fun alternative to using regular dice. It is accessible with VoiceOver and also has options to change the color of the dice and background. It can be used for students who cannot physically roll dice, read dice, or if you just don't have access to dice. Flashcards with the numbers 1-6 with large print and/or braille could also be used in place of the dice. The player would simply draw a card randomly from cards spread on the table, then turn it over to "roll" the number. The player returns the card to the table for the next player's turn. The instruction board text naming each character piece could be simplified for early learners or struggling readers or more descriptive for advanced readers. For example, in the Roll a Snowman Game, the teacher could braille "hat" instead of "felt hat" for a simplied version, or leave as "felt hat" for a more advanced version of the game. Click here to Download a PDF printable for "Roll a Jack O'Lantern" Game. Want more templates for tactile Roll a Character games? Check out the free and paid versions on SensorySun.org!